Happy Earth Day! 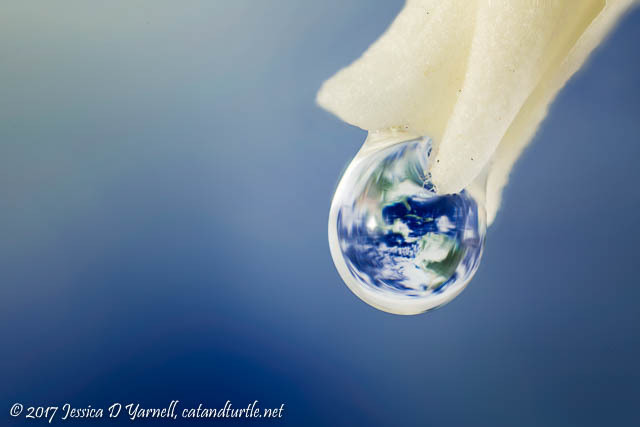 I’ve been planning a water droplet refraction of the planet Earth for Earth Day. I tried compositions with the droplet on top of a flower as well as below it. Ultimately I chose this one because the droplet was more spherical when hanging from the flower, and because I liked the analogy of the planet being carefully balanced like a water droplet on a flower at dawn. Let’s all do our part to protect the environment and the animals to keep our home in balance!